You don’t have to be a vegetarian or someone super-obsessed with healthy eating all the time to enjoy this (because we definitely are not! 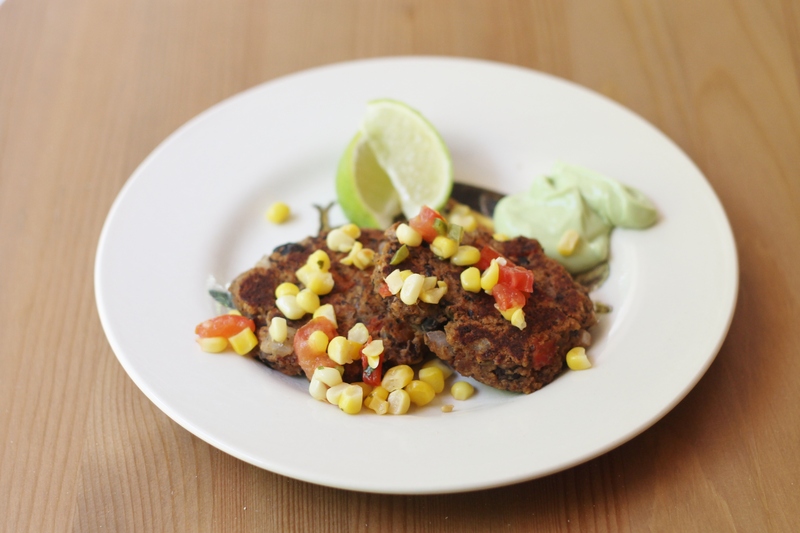 )- you only have to love a delicious meal, and these black bean patties certainly fit the bill. These may not look like anything special, because let’s face it, they are not the prettiest things ever, but the flavor is great. Don’t be tempted to skip out on the corn relish and the cream sauce, because they really add something to the dish! The best part about this meal is that it’s delicious, and also very healthy (which will help make up for the cupcakes, banana bread, and fruit tart that we posted in the last week! Sorry about that…). Frozen corn is fine to use, but fresh is just as good or better, so if you have access to it, use it! P.S. If you think you don’t like black beans, well, you actually probably do. Just try this recipe and you will understand! To make the bean patties, place half of the beans in the bowl of a food processor with 1 coarsely chopped bell pepper, the eggs, oregano, cumin, garlic, and chipotle. Process until smooth. Finely chop the remaining bell pepper. In a large bowl, lightly mash the remaining beans. Stir in the bell pepper, onion, and smooth bean mixture. Season to taste with salt and pepper. Stir in the cornmeal or breadcrumbs, a bit at time, mixing lightly just until the mixture firms up. If it is too sticky, add more cornmeal or panko. Chill the mixture for 30 minutes. Form the bean mixture into patties approximately 3½ inches in diameter. Heat about 2 tablespoons of canola oil in a large skillet over medium heat. Add the patties in batches, cooking until lightly browned and firm, about 3-4 minutes per side. Serve the patties warm topped with the corn relish and drizzled with the avocado cream sauce. Enjoy! Side Note: To roast a red bell pepper, place it on a baking sheet lined with foil. Bake at 475˚ F until the skin is browned and blistered, about 15 minutes. Turn a few times during baking. Let cool. Before use, peel off the skin. If you rather not roast your own pepper (though it’s easy to do and cheaper then store bought), you can buy canned roasted red peppers at the supermarket. Rinse off any oil before chopping them for this recipe.